- Forkin, C singled to center field (1-2 FKB). - Godfrey, L grounded out to 3b to third base (0-2 KF); Forkin, C advanced to second. - Tsitsikronis flied out to rf to right field (1-2 BSFF); Forkin, C advanced to third. - Poole, S flied out to cf to right center (2-1 BBK). - Lilley, J fouled out to 1b (3-2 BKBKB). - Huaining, Y struck out swinging (0-2 SKS). - Miller, C walked (3-2 BBBKKFB). - Rhodes, J struck out swinging (3-2 BFFBFFBS). - Warwick, C homered down the lf line, RBI (2-2 FBKB). - Wall, J lined out to ss (2-2 KBKB). - McManus, S lined out to 2b (2-1 BBK). - White, B hit by pitch (0-2 KK). - Whitefield flied out to cf to center field (1-1 BF). - Jing, Z lined out to ss through the left side (2-1 KBB). - Peterson, A homered to center field, RBI (3-2 BFKBB). - Siyu, Y grounded out to 3b to third base (0-1 K). - Na, L struck out swinging (1-2 KKFBS). - Forkin, C popped up to lf to left field (0-2 FF). - Godfrey, L grounded out to 2b to second base (1-1 KB). - Tsitsikronis grounded out to 3b down the lf line (0-2 FFF). 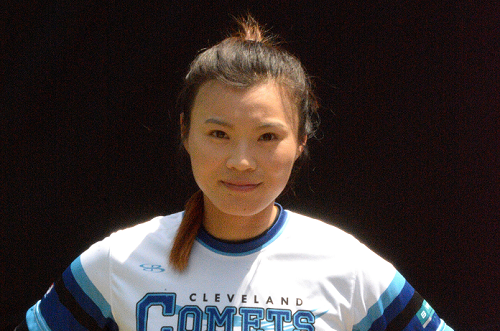 - Fei Fei, L struck out swinging, reached first on a passed ball (1-2 KKFBS). - Lilley, J singled to third base (0-1 F); Fei Fei, L advanced to second, advanced to third on a throwing error by 3b. - Lilley, J stole second. - Fei Fei, L picked off, out at third c to 3b. - Huaining, Y lined out to 2b (3-2 BBKKBF); Lilley, J out at second 2b unassisted. - Poole, S grounded out to 3b down the lf line (0-0). - Warwick, C popped up to 2b to right field (3-2 KBBFFFB). - Wall, J walked (3-2 KBBBFFB). - Wall, J out at second c to ss, caught stealing. - Parnaby, K to p for Taylor, J. - Miller, C struck out swinging (2-2 KBSBFS). - Rhodes, J grounded out to 2b to second base (1-2 KSB). - Jing, Z struck out swinging (2-2 FBBFFFS). - McManus, S flied out to lf to left field (1-2 KKB). - White, B struck out swinging (1-2 SSBS). - Lack, R pinch hit for Whitefield. - Lack, R struck out swinging (2-2 KFBFBS). - Weaver, M to 2b for Lack, R.
- Peterson, A struck out swinging (3-2 FKBBBS). - Siyu, Y struck out looking (1-2 KBKK). - Na, L struck out swinging (1-2 FFBS). - Weaver, M to dp for Forkin, C.
- Lack, R to 2b for Weaver, M.
- Weaver, M struck out looking (2-2 KBFFBK). - Godfrey, L singled to left field (0-0). - Tsitsikronis popped up to c (0-1 F). - Godfrey, L out at second c to ss, caught stealing. - Weaver, M to 2b. - Lack, R to dp. - Fei Fei, L struck out swinging (2-2 SSBBFS). - Lilley, J grounded out to p up the middle (0-0). - Huaining, Y struck out swinging (1-2 SSBS). - Poole, S singled up the middle (0-0). - Warwick, C out at first p to c, SAC (0-1 F); Poole, S advanced to second. - Long, V pinch hit for Wall, J. - Long, V grounded out to 2b (0-0); Poole, S advanced to third. - McManus, S fouled out to rf (2-1 BKB). - Long, V to cf. - Rhodes, J doubled down the rf line (0-0). - Robinson, S pinch hit for Jing, Z. - Robinson, S tripled to left field, RBI (0-1 S); Yue, X scored.